The Detroit Film Theatre is probably best known for screening new foreign language, documentary, and American independent films that you are not likely to see in a mainstream commercial theater. But the DFT has also played an important role in building an audience for classic American and foreign movies in a historic theater setting, several years before the Michigan Theater and Redford Theatre re-invented themselves with similar programming. In the DFT’s first year (1974), it presented longtime favorites like Singin’ in the Rain (1952); North by Northwest (1959); Duck Soup (1933); Sons of the Desert (1933/34); and The Big Sleep (1946). It also screened lesser known classics like Night of the Hunter (1955); Touch of Evil (1958); Force of Evil (1948); It’s a Gift (1934); and the silent Foolish Wives (1921). The DFT also reached back into the archives for films from foreign lands, like Day of Wrath (1943); L’atalante (1934); Forbidden Games (1952); Olympia (1938); and a restored version of Lola Montès (1955). 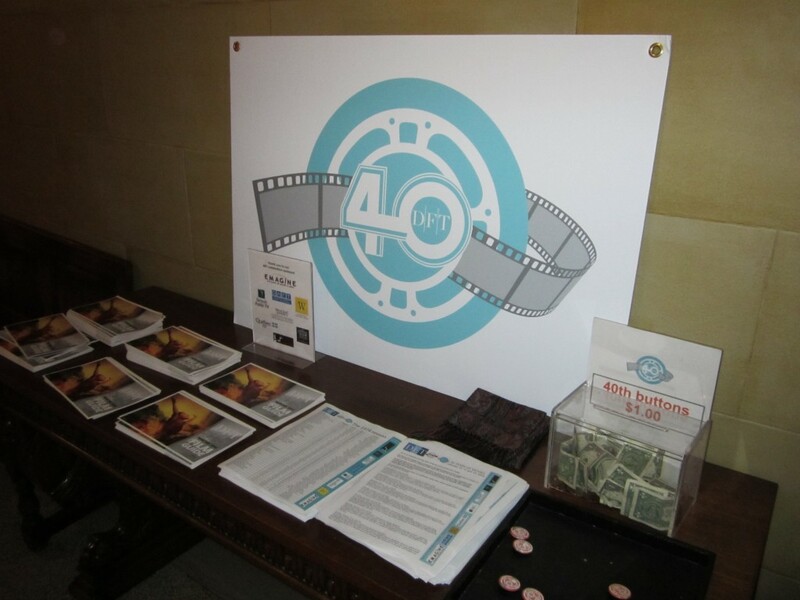 These DFT films were part of a complete list of 1974 DFT movies that were handed out to visitors to the DFT’s 40th anniversary celebration on January 10-12, 2014. The DFT has lasted so long that it now has its own collection of classic films. The anniversary weekend included ten movies that had previously screened at the DFT. The weekend began with the very first DFT film from January 4, 1974—the 1971 French Canadian Mon Oncle Antoine. Before Mon Oncle Antoine, several speeches were given. Current house manager Margaret Thomas and former house manager Larry Baranski talked about their wide variety of experiences with DFT films, guests, and audiences. A representative of the Quebec government talked about the significance of Mon Oncle Antoine. “It’s been such an incredible 40 years, all of the really amazing film artists that have come through,” remarked Larry. And of course, DFT founder Elliot Wilhelm spoke. He talked about how he tried to created a unique new film program for Detroit area moviegoers, and how difficult it was to select movies for that first season from the vast history of cinema. He was greeted with several rounds of applause, and was given special tokens of recognition after he spoke. Also speaking was Dan Alpert, who supervises development and communications at Detroit Public TV. DPTV and Elliot Wilhelm have teamed up since 1996 to present weekly classic movies, which include insightful comments by Elliot before and after the feature presentation. It was just another example of how Elliot Wilhelm has helped Detroit area film lovers appreciate the multifaceted wonders of movies. 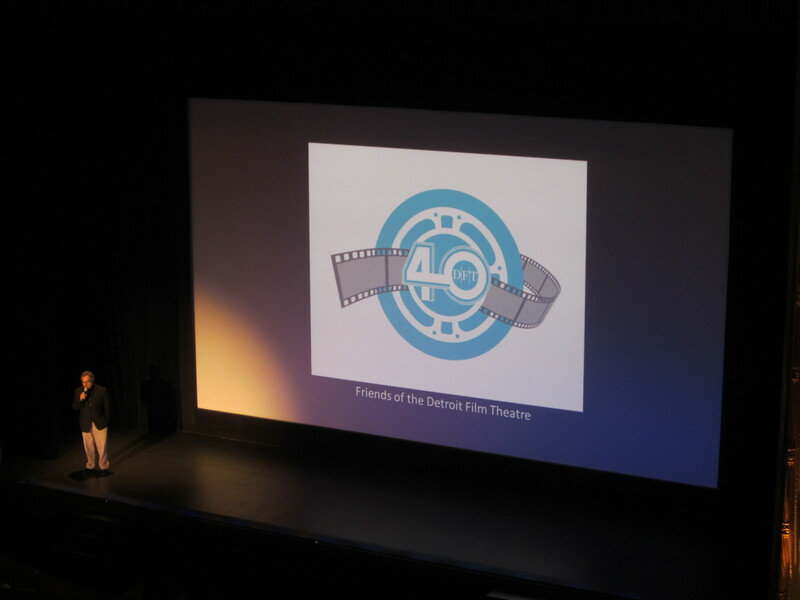 The DFT’s 40th anniversary also kicked off the DFT’s Winter 2014 season, when it will continue to promote the current and past history of film. When the DFT announced last fall that it would celebrate its 40th anniversary with 10 films over three days, fans of the theater wondered what movies would be shown. And once the list came out, many probably immediately compared it with the list of films that they would have screened. If those lists had all been revealed, they would have probably demonstrated the wide variety of films and film interests that have converged at the DFT. And I’m sure Elliot Wilhelm would want it no other way. To pace myself and not get too much of a good thing, I took in four of the 10 movies—Mon Oncle Antoine (1971); Burden of Dreams (1982); In the Mood for Love (2000); and Russian Ark (2002). Also showing on the DFT’s anniversary weekend were Talk to Her (2002); My Left Foot (1989); Dracula (Spanish version, 1931); Tristana (1970); El Norte (1983); and Wake in Fright (1971). I’ve been going to the DFT for more than 25 years—about 60 percent of the DFT’s history—and six of my favorite films from that time are In the Mood for Love; Russian Ark; Wings of Desire (1987); Lamerica (1994); After Life (1998); and, best of all, Ponette (1996). To fill out the list with movies that screened before I started attending the DFT in 1988, I skimmed through Elliot Wilhelm’s informative and insightful 1999 book VideoHound’s World Cinema: The Adventurer’s Guide to Movie Watching. This book is a guide to movies from outside the United States and also serves as a history of the DFT through the late 1990s. I would have included Mon Oncle Antoine, as the first DFT film, and Burden of Dreams to represent documentaries. To get to 10, I would have also included François Truffaut’s The Last Metro (1980), which opened the DFT’s ninth season in August 1981. I also would have screened Effi Briest (1974), whose stately black and white photography made a strong impression on me when I saw it at college in the late 1970s. All weekend at the DFT, I felt a special vibe, similar to what I felt at anniversary celebrations at the Michigan Theater (Pride of Ownership) and the Redford Theatre (The Fullness of Its Years). I found myself reflecting on my different experiences at the DFT, and how my understanding and reactions to film have changed over the years, thanks in part to the DFT. As I get older, I react less emotionally to movies, but that has been replaced with a mixture of quieter, more focused emotions and thoughts that have given me great satisfaction during and after a good movie. After In the Mood for Love ended on the evening of Saturday, January 11, the uniqueness of the weekend strongly hit me. Usually, a powerful film like In the Mood for Love anchors the weekend as the spotlight attraction. But this time, it was just one of many great experiences, and as I drove home, I looked forward to seeing Russian Ark on Sunday, January 12. Copyright © 2014 by Robert Hollberg Smith, Jr. This entry was posted in Detroit Film Theatre. Bookmark the permalink. I enjoyed reading your article on the DFT’s 40th anniversary celebration. Dave’s 10th anniversary with the DFT is this year, coinciding with his accompanying four silent Hitchcock restorations. We hope to see you there.